LAREDO, Texas (KGNS) A raise for teachers could be coming if the Texas legislature approves a bill. 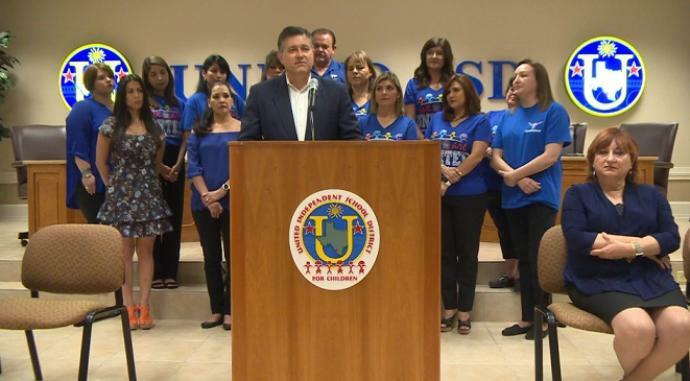 State Representative Richard Peña Raymond announced that he is introducing a bill proposing a $1,000 raise for public school teachers. The bill had already been proposed during the regular session, but expired when the session closed. The topic is being brought back by the governor during the special legislative session. LAREDO, Texas (KGNS) – The 85th Texas Legislative Session has come to a close with hundreds of bills signed into law, including the controversial, ‘Sanctuary Cities’ bill. KGNS spoke with Representative Richard Peña Raymond on the recent session and asked what his opinions were on the bills passed. One bill Raymond felt strongly about was Senate Bill Four. Raymond says that there were a lot of protesters in the gallery protesting the bill. A bill Raymond wanted to see passed dealt with the Texas Medical Board and property tax relief. State Rep. Richard Peña Raymond said Tuesday he passed legislation to remove the toll on Camino Colombia, or State Highway 255, making it the first road statewide to have its toll removed. Raymond said motorists were not using the 22-mile stretch that connects the Colombia Solidarity International Bridge to Interstate 35 because of the cost. A private vehicle pays about $3 to $5 while a commercial vehicle pays approximately $5 to $20, according to the Texas Department of Transportation. “Starting Sept. 1, it’s free,” Raymond said.